The primary suspect in the truck attack on a Berlin Christmas market had links to a local group of Islamic State sympathizers, bucking beliefs that Monday’s assault was carried out by a lone-wolf radical. 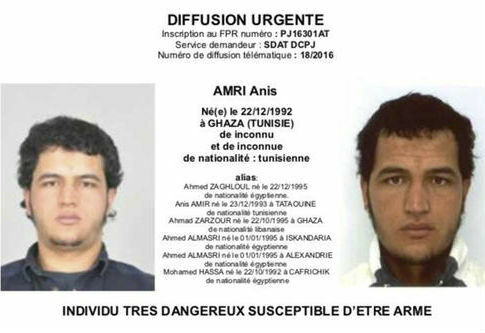 Anis Amri, a Tunisian man who turned 24 on Thursday, was in "regular contact" with the group's leader, Abu Walaa, an Iraqi preacher who was arrested in Germany last month on charges he was recruiting jihadists to fight for ISIS, the Daily Beast reported, citing German media. Four others were arrested alongside Abu Walaa in November on accusations of operating an ISIS recruitment cell. Abu Walaa, who authorities have also identified as Ahmad Abdulaziz A, made his base at a mosque in Hildesheim, some 170 miles west of Berlin, where he was dubbed the "man with no face" because he delivered sermons with his back to the camera wearing a hooded black cloak. Multiple ISIS defectors previously told German media Abu Walaa was the terrorist group's "number one" man in Germany. German authorities who infiltrated the preacher's group in 2015 found that Abu Walaa was planning attacks against police stations and law enforcement officials. The preacher remains in custody. Police launched a Europe-wide manhunt for Amri on Wednesday after finding identification documents in the cab of the truck that plowed through the Berlin Christmas market and killed 12 people and injured 48 others. Authorities said Thursday they also found Amri's fingerprints in the cab. Two American citizens were among those injured in the attack, a spokesman for the U.S. embassy in Berlin said Thursday, according to the Wall Street Journal. The State Department would not provide any further information on their status. A European arrest warrant says Amri uses six different aliases and is considered armed and dangerous. Germany has offered a 100,000-euro reward for information leading to his capture. This entry was posted in National Security and tagged Germany, ISIS, Islamic State, Terrorism. Bookmark the permalink.